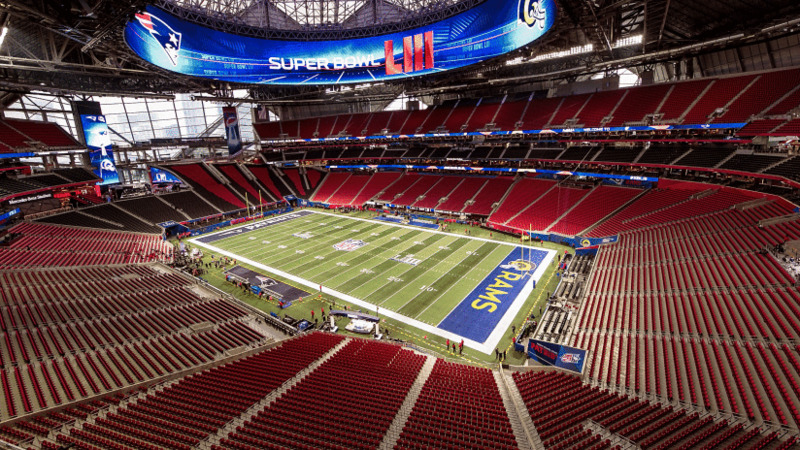 ATLANTA – Since opening its doors in late August of 2017, Mercedes-Benz Stadium has hosted more than its fair share of big-time sporting events – a college football national championship, the SEC title game and an MLS championship to name just a few. 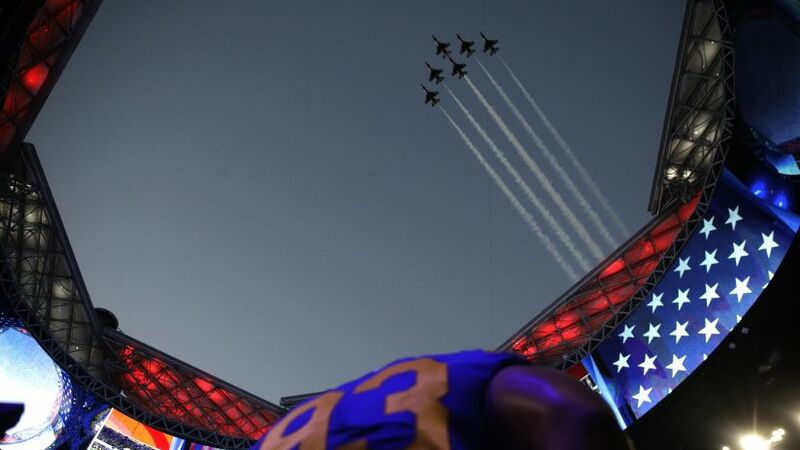 It’s Super Bowl Sunday, and in a matter of a few hours, thousands of people – fans, athletes, celebrities and dignitaries alike – will walk through this one-of-a-kind structure’s gates to witness the biggest event in American sports when the upstart Los Angeles Rams take on the love-’em-or-hate-’em New England Patriots. 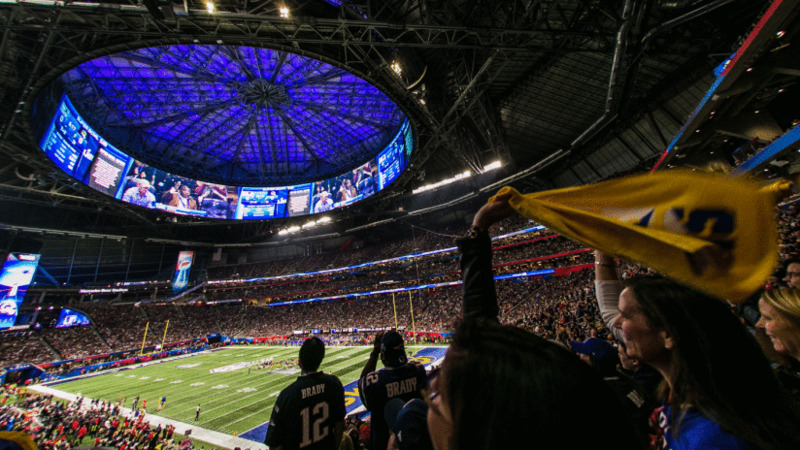 Both teams – and many from their respective fan bases – are making their first-ever trek to this iconic structure, and we wanted to get their first reactions when they first lay their eyes upon the 360-degree, 62,000-square-foot Halo Board, the fan-friendly prices, artwork and unique architecture. 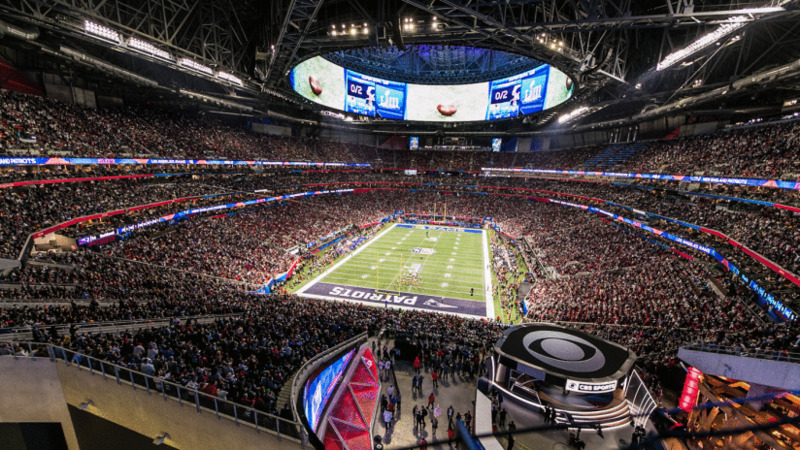 While millions of people are watching the big game from home, we’ll be walking the concourses chronicling the day from the eyes of fans, in and outside of the stadium – from the early morning hours to the singing of the national anthem, kickoff and the halftime show to the Lombardi Trophy presentation, when a 53rd Super Bowl champion is crowned. 9:57 a.m. ET: The gates aren’t expected to open to the general public until 2 p.m. and, not surprisingly, there’s no one in sight outside right now. The rain is coming down for the first time all week, it’s cloudy, quiet and damp right now. For the few of us who are here, though, we know all of that is about to change. 10:49 a.m. ET: We get our first look inside the stadium and it feels like the calm before the storm. The seats are empty but television network crews and stadium staff are busy at work. Super Bowl LIII graphics are circulating on the Halo Board. There’s definitely a quiet excitement in the building. 12:56 p.m. 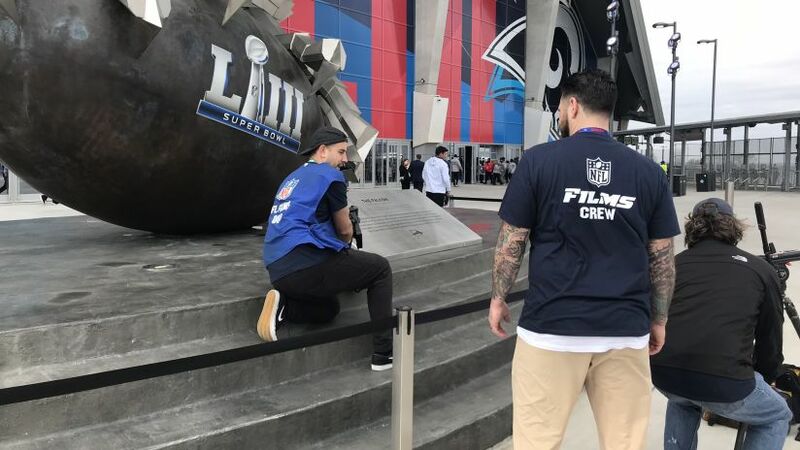 ET: Back outside, an NFL Films crew is getting some last-minute images of the 41.5-foot tall falcon statue outside Gate 2. Philip Gushue, one of the crew’s cinematographers, is gushing over the facilities and stadium sight lines, inside and out. All of them say they can’t wait for the game to start. 1:48 p.m. ET: The first group of fans are starting to gather around the gates. 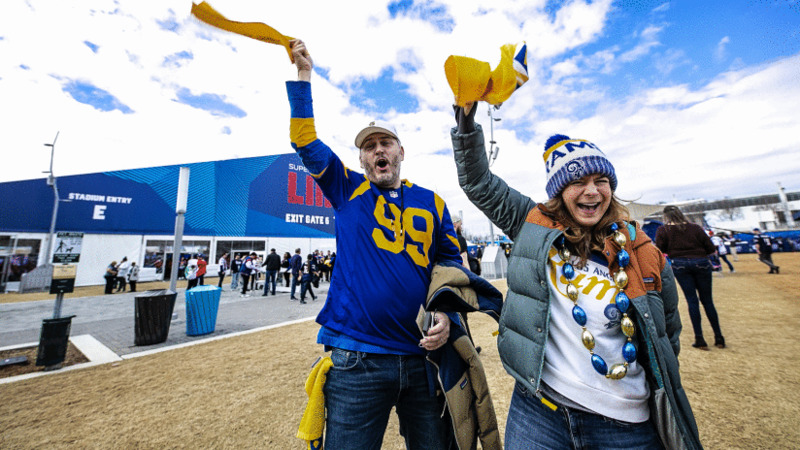 Ann and Pierre, a couple of Rams fans who made the trek from California, acknowledged that they were “definitely in the minority” as they waited to get in. Both called it “an amazing facility” from the outside and couldn’t wait to see the inside. 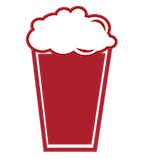 1:50 p.m. ET: The crowd is getting larger by the minute, and Patriots fans far outnumber the Rams so far. 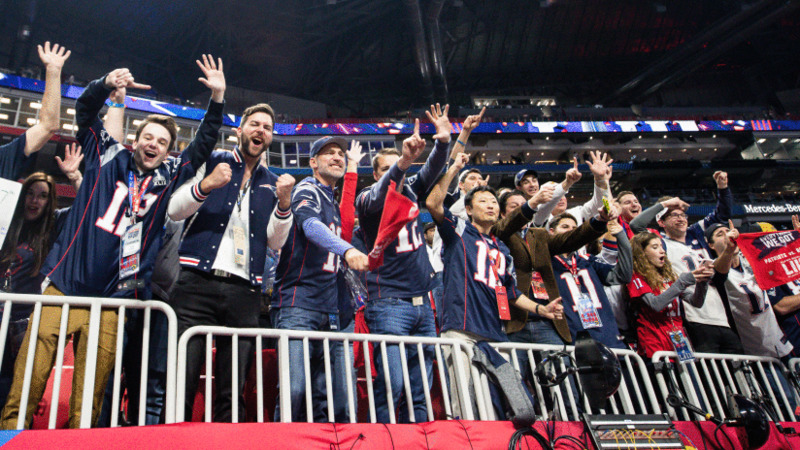 A rowdy group from Massachusetts is at the front, but when asked about their experience so far, they have nothing but positive things to say about Atlanta, its “Southern hospitality” and say they can’t wait to check out the inside Mercedes-Benz Stadium. 2:01 p.m. ET: The first fans come through the turnstiles and literally run for the stadium doors. Once inside, most head right for the overlook near Molly B’s restaurant to see the field, the Halo Board and the CBS Sports set. The phones are out and there are tons of photos being taken. 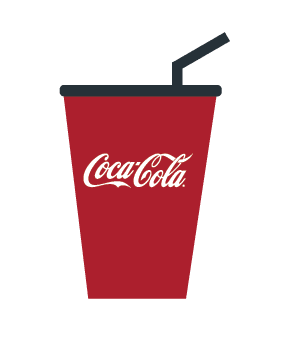 2:10 p.m. 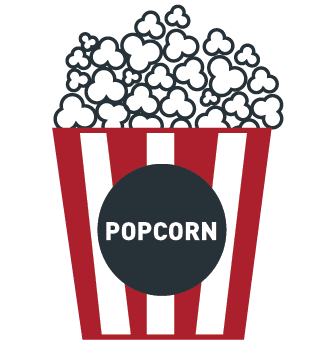 ET: Once fans had a chance to catch their first glimpse of the field, we decided to ask them about their initial impressions as they turned away from the overlook. 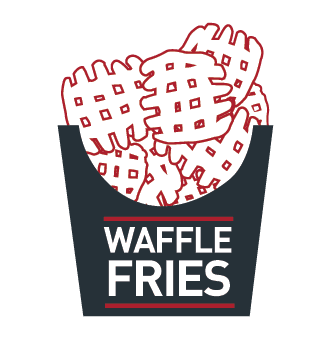 Many were heading toward the concession stands or wanted to “just walk around” because there was “something amazing at every turn.” Needless to say, most were impressed and they had plenty to say about the hospitality, low prices and, of course, the Halo Board. 2:19 p.m. ET: The last time Patriots fans Tori and Alex were in Atlanta to watch a game, it was at the old Georgia Dome. They were inside Mercedes-Benz Stadium less than two minutes and both said they were blown away by the structure. 2:24 p.m. ET: Sandra and Alex, a pair of Rams fans who traveled all the way from Los Angeles for the game, had just bought some food and drinks at Fox Bros. when I caught up with them. Alex said he couldn’t believe how low the concession prices were at the stadium. 2:26 p.m. 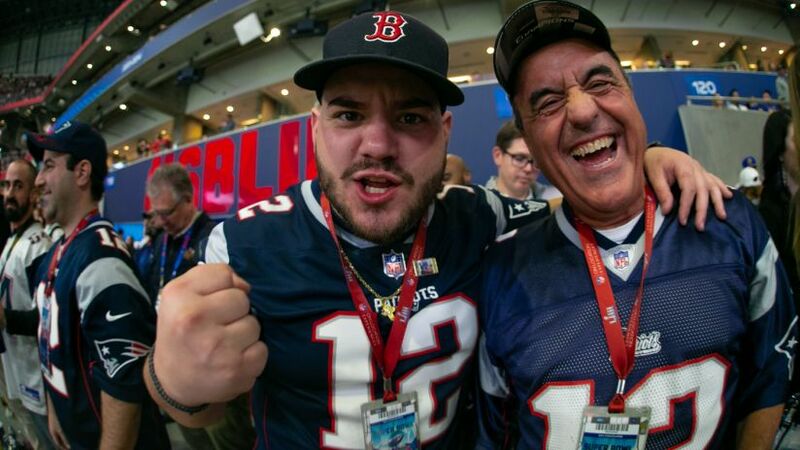 ET: I ran into a Patriots fan wearing sunglasses – a guy named Eric who is from Glastonbury, Conn., I was going to keep walking, but thought, “Oh, why not” and asked him what his early impressions of everything were so far. He got right to the point before walking away. “I hear there’s $5 beers and $2 hotdogs, that’s all a man needs,” he said. 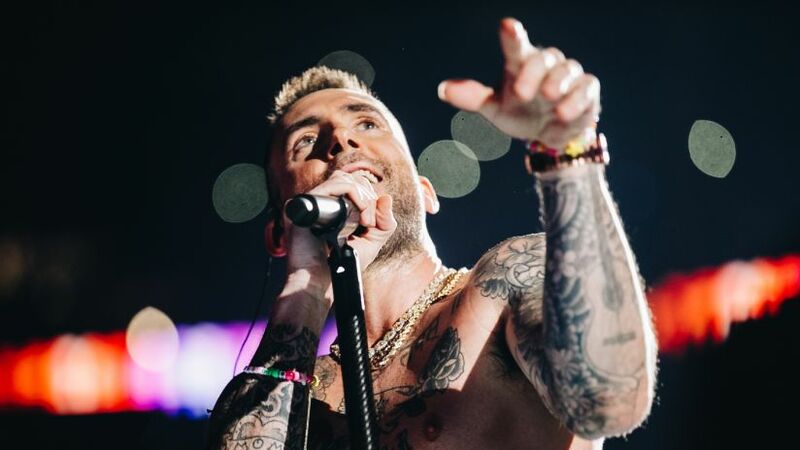 “Gillette (Stadium) is nice, this is nicer…” -Mike from Boston. 2:38 p.m. ET: A few minutes later I met Mike and Steve, a couple of straight-shooting Patriots fans who had some strong thoughts about how the day would unfold and the stadium. Steve took it a step further and included a message for Patriots owner Robert Kraft. 3:31 p.m. ET: Patriots receiver Julian Edelman is the first player to hit the field, and he is wearing shorts, a T-shirt and donning headphones. 5:22 p.m. ET: The stadium bowl is starting to fill up with the fans and it’s pretty clear after three hours that the majority of them are wearing the Patriots’ red, white and blue colors. I don’t know what the exact ratio is, but to the naked eye it looks like there’s 10-15 Pats fans for every Rams fan. Patriots players come out of the tunnel in full uniform for the first time – New England receivers Julian Edelman and Chris Hogan trot out to a loud applause. It suddenly feels like a Patriots home game. 5:27 p.m. 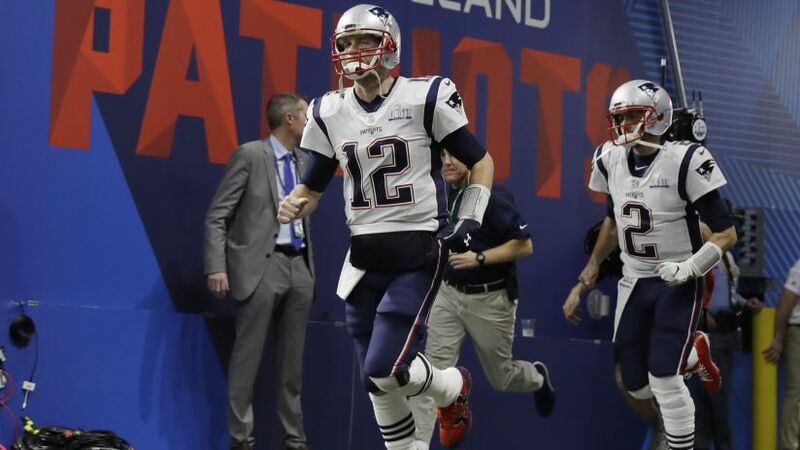 ET: A few minutes later, Tom Brady and backup quarterback Brian Hoyer make their entrance in full uniform and the stadium is filled with both cheers and jeers. The pro-Patriots fans drown out the Rams’ fans boos. Regardless, it’s loud. More importantly, it means that we’re closer to kicking this thing off. 5:29 p.m. ET: Rams quarterback Jared Goff makes his entrance and, wow, what a difference. The boo birds at Mercedes-Benz Stadium are out, and the place is abuzz with energy. 5:58 p.m. ET: In-stadium host Scott Hanson of the NFL Network decides to play a game with a crowd to find out which fan base is louder. He asks Rams fans to make noise first. It’s, well, noticeable. When he asks the Patriots fans, the place erupts and it’s not even close. 6:02 p.m. ET: The much-talked about roof at Mercedes-Benz Stadium begins to open up. The increasing frequency of flashes in the stands is also noticeable. So are the chorus “Ooohs” and “Wows.” At the same time, there are a lot of comments (and questions) about whether or not the roof will remain open for the game. 6:03 p.m. ET: The CBS analysts make their pre-game predictions in front of the crowd. Nate Burleson is the only to pick the Rams and, predictably, he gets booed. 6:19 p.m. 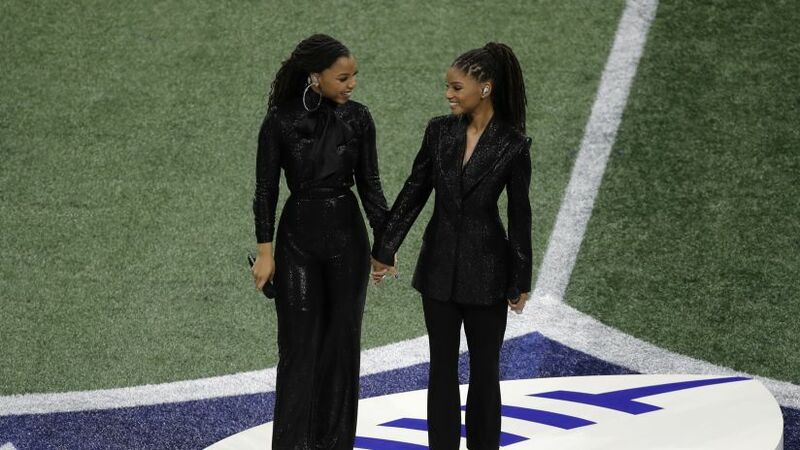 ET: Atlanta natives Chloe & Halle Bailey perform a gorgeous rendition of “America the Beautiful” and the crowd loves them. At the same time, images from around the stadium — including players — are displayed on the Halo Board. Tom Brady and Rob Gronkowski draw the loudest applauses. 6:22 p.m. 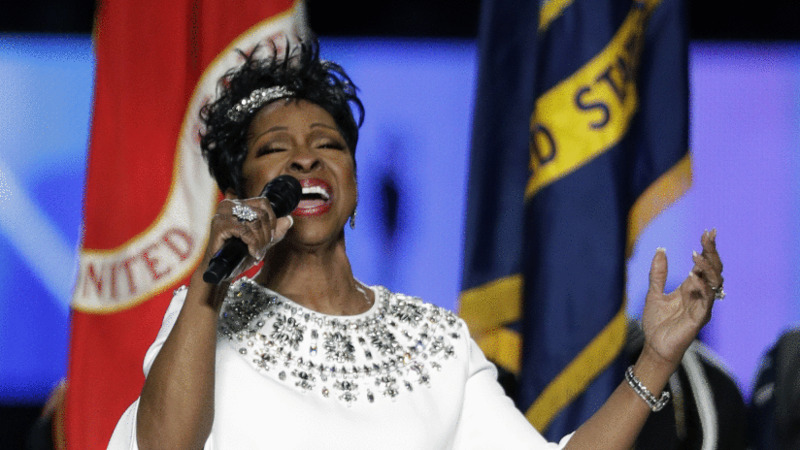 ET: Atlanta’s own Gladys Knight belts out the “Star Spangled Banner” and the U.S. Air Force Thunderbirds cap it with a perfectly timed flyover. 6:24 p.m. ET: The “Beat LA!” chants have started. 6:28 p.m. ET: There’s huge applause for Rev. Bernice King, the youngest daughter of the late civil rights leader Martin Luther King Jr., after she partakes in the coin toss. It’s an awesome moment for a city steeped in civil rights history. 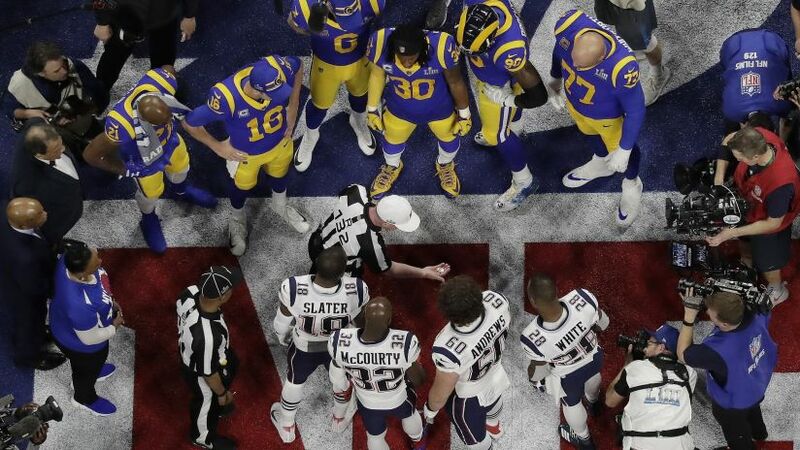 The Rams won the toss and elected to defer, giving the Patriots the ball to start the game. 6:30 p.m. 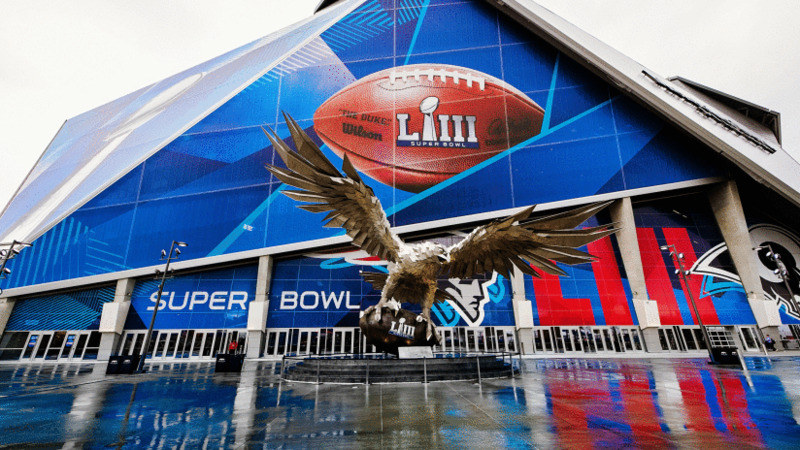 ET: Super Bowl LIII kicks off. 6:35 p.m. ET: Tom Brady is picked off on his first pass attempt by the Rams’ Cory Littleton on the opening drive. For the first time all night, Rams fans are louder than the Pats fans and yellow rally towels can be seen throughout the stadium. 6:53 p.m. ET: Rams fans Danny Trejo and comedian Tracey Morgan are shown on Halo Board and receive a loud applause. 7:24 p.m. ET: The Patriots score first. Stephen Gostkowski boots a 42-yard field goal in the second quarter to give New England a 3-0 lead. 7:53 p.m. ET: The Patriots decide to go for it on fourth-and-1 and fans throughout the stadium are on their feet. Tom Brady’s pass falls incomplete and Rams fans crank up the noise. 8:07 p.m. ET: Halftime. Low-scoring game. The Patriots lead 3-0 and have now held the No. 1 and No. 2 teams in total offense to zero first-half points in consecutive games. The Rams have just 57 total yards while Julian Edelman leads the Patriots with 93 yards receiving. 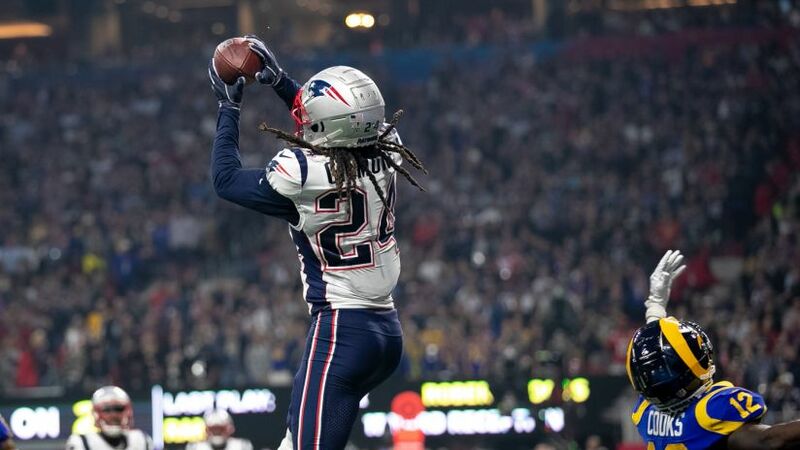 Believe it or not, it’s not the lowest-scoring half in Super Bowl history. Super Bowl IX between the Steelers and Vikings in 1975 still holds the record for the lowest combined score for a first half in a Super Bowl: 2-0. The sound quality is solid and the fans are getting into it. At the same time, the fireworks outside the stadium are amazing. 8:33 p.m. ET: The second half is underway and the “Beat LA!” chant breaks out again during a TV timeout. 9:05 p.m. ET: Rams tie this game up on Greg Zuerlein’s 53-yard field goal with 2:15 left to go here in the third quarter. It’s the second-longest field goal in Super Bowl history. Steve Christie had a 54-yard field goal in Super Bowl XXVIII. We’re also on track to have the lowest-scoring Super Bowl through three quarters. 9:13 p.m. ET: We’re entering the fourth quarter tied at 3-3 – the fewest combined points in Super Bowl history. It’s also the second time in history that two teams have entered the final quarter of play tied (Patriots-Eagles in Super Bowl XXXIX). I have a feeling the fans here are in for a fourth-quarter treat. 9:33 p.m. 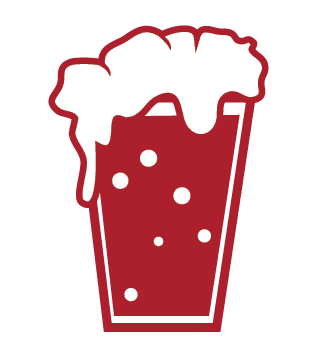 ET: Tom Brady completes four straight passes – including two to Rob Gronkowski (for 18 and 29 yards) – and drives the Patriots right down the field. Rookie running back Sony Michel, a University of Georgia product, punches it in from 2 yards and we finally have a touchdown scored in Super Bowl LIII. 9:35 p.m. ET: Patriots fans are going nuts right now. 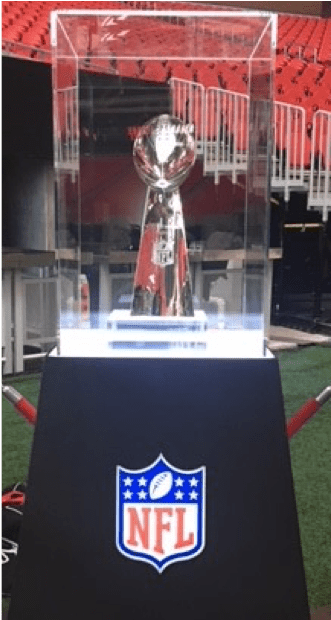 I’m getting the feeling they’re starting to smell a win – and yet another Lombardi Trophy. 9:41 p.m. 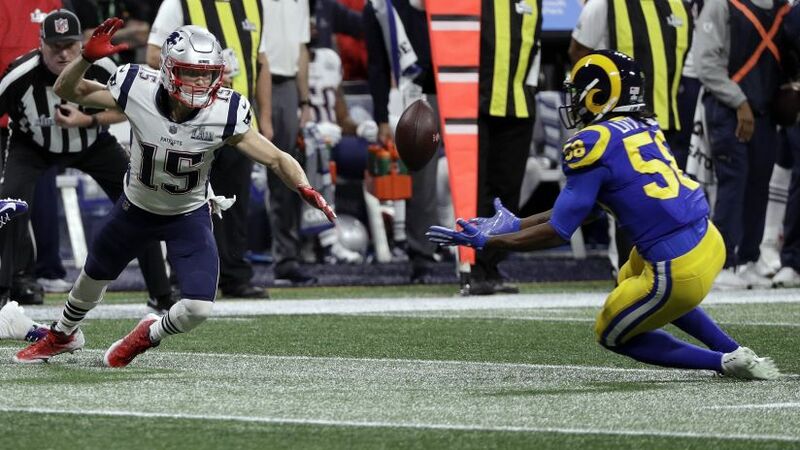 ET: Facing a second-and-10 on the Patriots’ 27-yard line, Rams quarterback Jared Goff is pressured, floats a pass intended for Brandin Cooks and it’s intercepted by New England’s Stephon Gilmore on the 4-yard line. 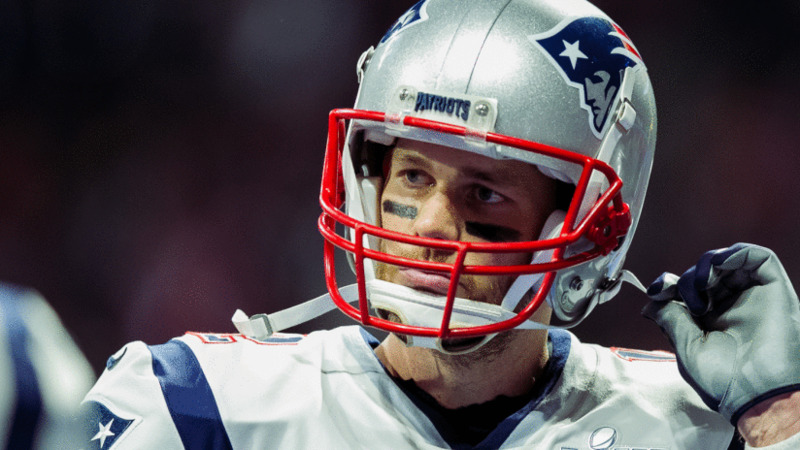 The Patriots, up 10-3, take over with 4:17 remaining in the fourth quarter. 9:58 p.m. ET: Stephen Gostkowski kicks a 41-yard field goal with 1:16 left to play, making it a two-possession game. 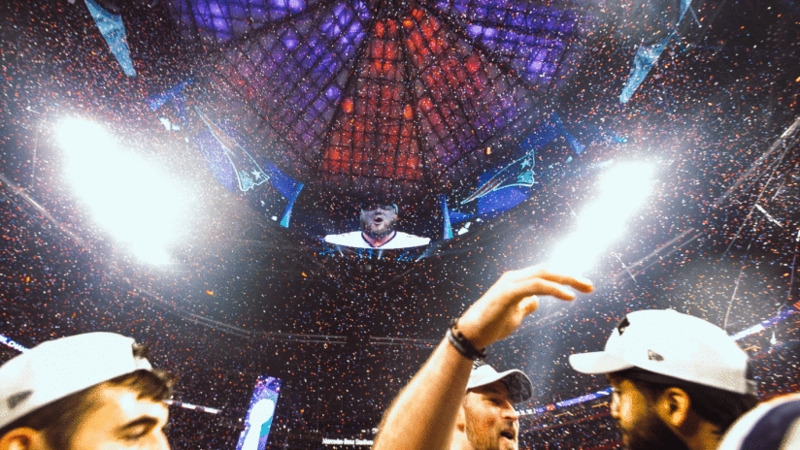 Patriots fans know their team is on the cusp of another Super Bowl title and start celebrating. 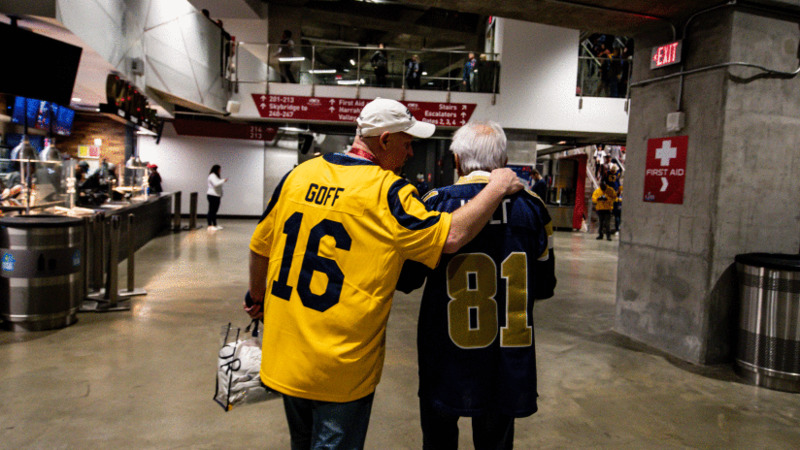 Rams fans begin heading out to the concourse. Some stop to watch the final minute of play on the stadium TV monitors. 10:04 p.m. 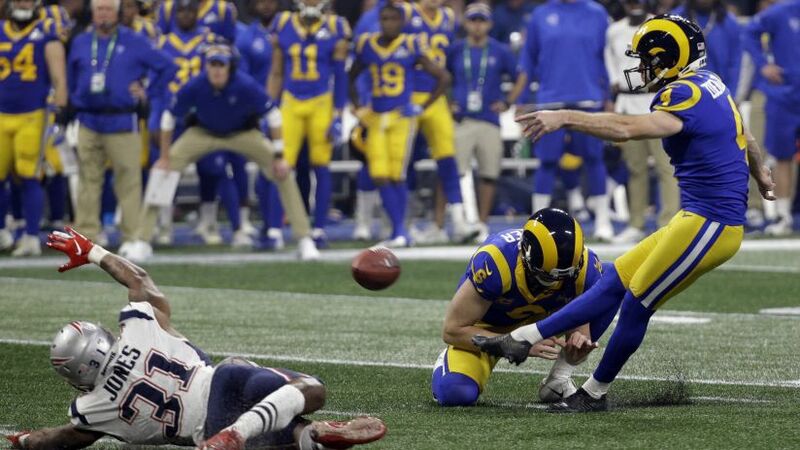 ET: After Rams kicker Greg Zuerlein misses a field goal attempt from 48 yards out, the Patriots take over with 5 seconds left. Tom Brady takes a knee. Game over. 10:10 p.m. 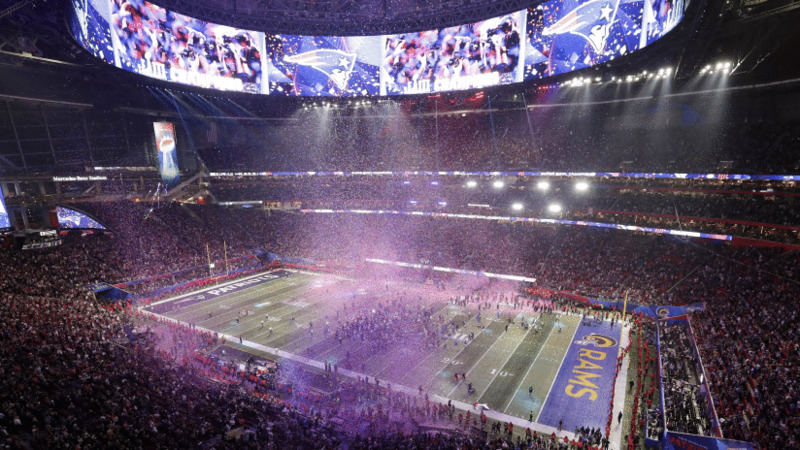 ET: The New England Patriots win 13-3 and are Super Bowl LIII champions – and the first to be crowned at Mercedes-Benz Stadium. 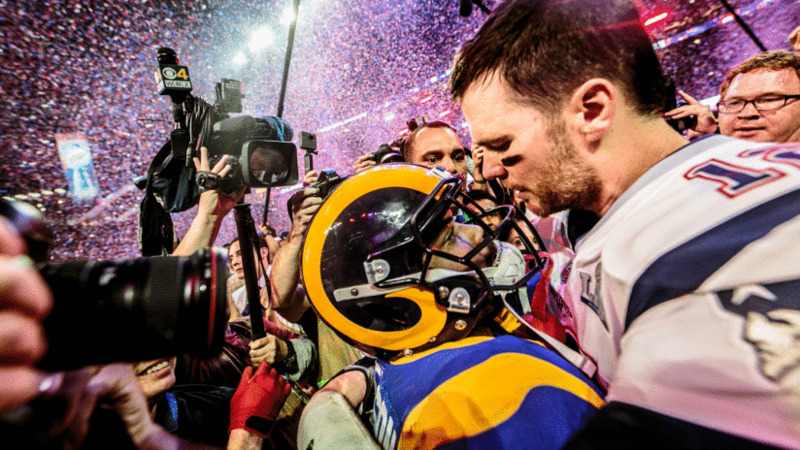 Julian Edelman is named the game’s Most Valuable Player. The Patriots have now won their sixth Super Bowl title, tying the Steelers for the most all-time. All of New England’s championships have come since 2001. For some perspective, it took the Steelers 35 seasons to do it. Another big winner Sunday night? Mercedes-Benz Stadium, its staff and the entire city of Atlanta. Just ask all of the Rams and Patriots fans who were there. I’m pretty sure they’ll tell ya all about it. 11:05 p.m. 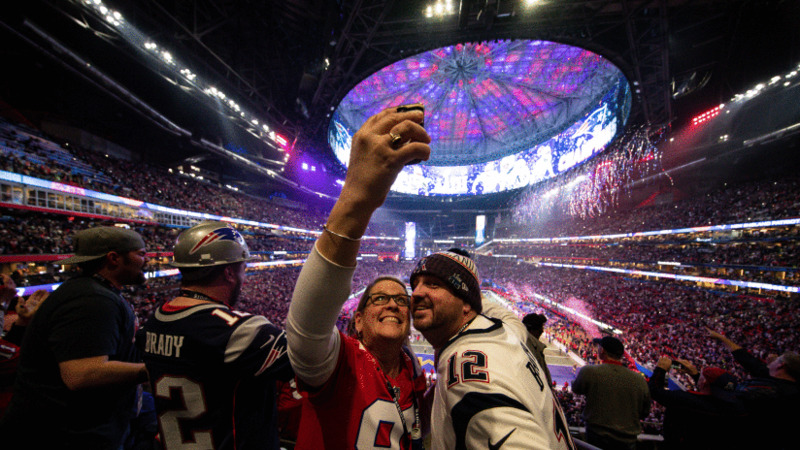 ET: It’s time to jump on the MARTA (with lots of rowdy Patriots fans) and head home.